To help us celebrate, we assembled a wonderful mix of people involved with data in the Chicagoland area. We invited friends, former colleagues, data luminaries, investors, students, and future clients. We were overwhelmed by the response, and couldn’t be more grateful for the conversations and support we had. 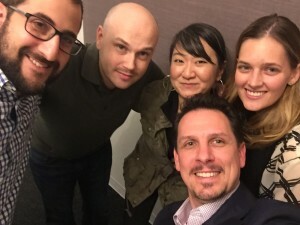 The five founding inhabitants of our Chicago office (from left to right): Justin Pront, Dmitriy Feferman, Jin Lim, Chris Geissler, and Heather Nelson. There is a great dialog around data in Chicago, as we discovered in our conversations. Some wanted to know what we see happening in the world of data, especially in Silicon Valley. Others were intrigued by SVDS and why we are in Chicago. It was great to be able to report that we’re not just about to start up in the city, but in fact we’re already underway with five local employees here, including a Sales & Client Success lead, a Senior Data Engineer, and Solution Architects specializing in holistic data science and engineering approaches. We are grateful to all who joined us, and there are too many to thank here individually. But there were two leaders from the data world I was personally excited to spend time with, having worked closely together in the past. 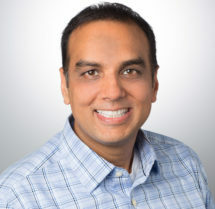 Rayid Ghani is former Chief Data Scientist for the Obama campaign, and currently leads the Data Science for Social Good program at the University of Chicago. He and I worked together as part of my first analytics team at Andersen Consulting. Jeanne Harris, co-author with Tom Davenport of Competing on Analytics and Analytics At Work, is also a former teammate: she built the original Business Intelligence practice at Andersen years ago. Our former colleagues are doing all kinds of interesting things: working in everything from ad tech to government—some still consulting, others at startups-turned-household-names. It was a great feeling to have old friends like these turn out to help us celebrate this milestone in our company’s growth. All of us at SVDS are excited to be expanding to Chicago. We have found a great initial home for our current team of five at 333 N. Michigan, and look forward to adding more colleagues and customers in the neighborhood very soon. Chicago is an energetic local market with companies in all industries—all looking to use data for competitive advantage. We look forward to developing additional local relationships with academia and other institutions as well. If you’re in the neighborhood, please come say hello!